We were only able to put on one Old School Aquathon this year, so we picked the 4th of July since that was our biggest turnout last year. A few weeks ago we were worried because we didn't have many sign ups, but as it got closer we got a bunch so it was a go. Then Marty put the t-shirt order in, THEN a bunch more people signed up. And we had a bunch of race day signups - this was great for our participant list, but not so good for not having ordered too many extra shirts. I tried to explain profit margins and t-shirt orders to one competitor who was pretty upset about not getting one, but I don't think she was very satisfied. Always with the t-shirts! Aquathons are fun and they are HARD! (as a side note, if you happen to like the Old School Aquathon and want to do another next summer, feel free to let Jason and Marc know at fsseries.com.) We keep this very low key and it's a nice atmosphere for a race/awesome workout. 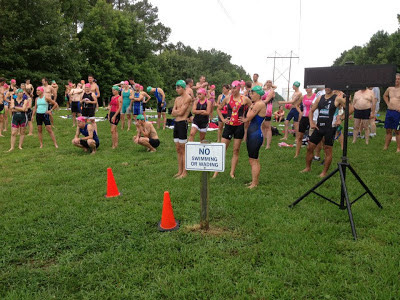 I truly believe sprint triathlons are much easier than sprint aquathons! You go from breathing hard out of the water and through transition -- right into a 3mile run! There's never a chance to catch your breath, unlike on the bike where your heartrate always comes down a bit. Then you go back and swim - with your heartrate still through the roof, your entire body tired, and you want it to move without much oxygen? Let's just say that THAT swim is always super challenging, no matter who you are. Pre-race instructions. See that sign? Yeah, we break all the rules. Sporting the OSB onesie and looking as cool as ever. 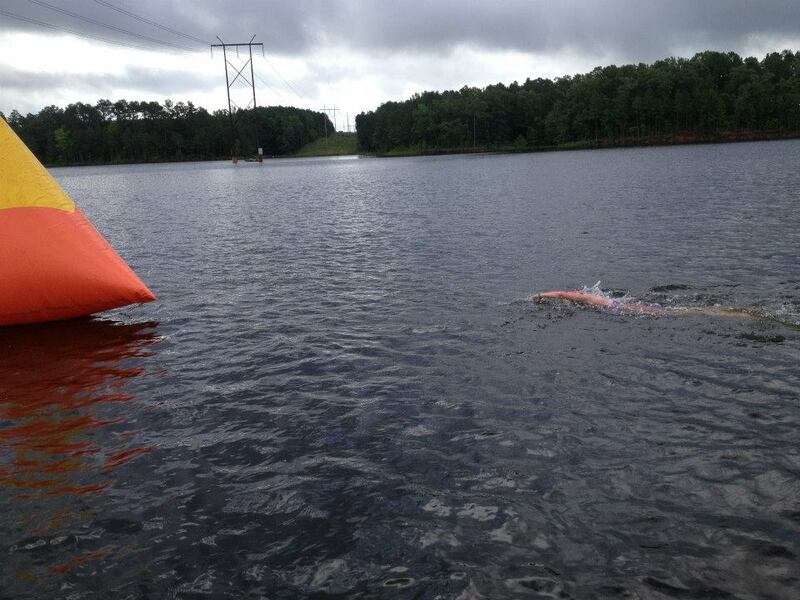 The race was a 400 meter swim, 3mile run, 400 meter swim -- ISH. Nothing's really measured but I actually think it was fairly close to those distances. We had two waves since the swims are so short, and the men went first. When we started I sprinted! I was in 1st/2nd for about 75 yards, and then the real swimmer took off and I was wondering where everyone else was. Probably they started off at a more reasonable pace because when I got to the first turn buoy I was tired and decided to ease up. Much to the dismay of Mary, who was drafting and started touching my feet, and then just simply went around me. Sorry! I got out of the water just behind her, Super-Swimmer was in first, and Jenny-from-Va got out behind us but did some sort of voodoo magic and was in transition for around 2 seconds. 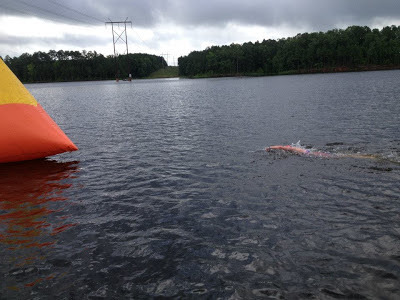 I was able to pass everyone within the first few minutes of the run and my goal was to put as much time on them as possible because my overall goal was to absolutely not have to swim too hard on that second swim. Did I mention how hard that swim is? Yeah, no way I wanted to get into some sort of sprint on that one. I forgot how rolly the trail is at Harris Lake. And because of all the recent rain, very muddy, too. The run was hard and although the temperature wasn't super hot, the humidity was very high. I tried to cheer for everyone I knew but I was sucking air out there and missed some people. It was a two loop course so there were people always around. Making the turn for the 2nd loop. Jenny-from-Va is no slouch so I couldn't back down at all. She and her husband have come down for all of our aquathons and between the two of them have won most! 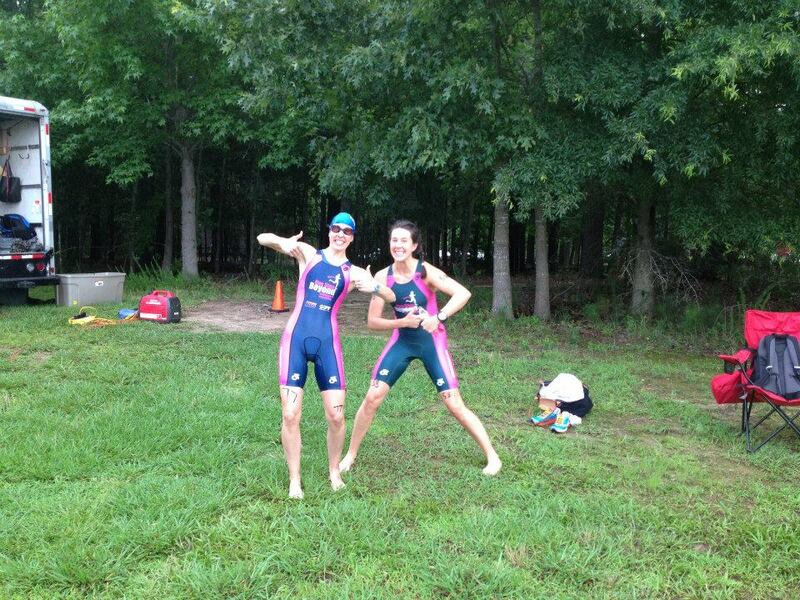 I probably had about 30 seconds on her heading into the last swim (but knew she would cut into that in transition!) but we seem to be similar speeds swimming-wise so I was able to swim/gasp my way through. Marty took pictures from our SUP. In 3rd place for women - Mary R! I thought he did it on purpose, like sort of weird to call my name since we put them on and I'm handing out the pint glass awards. But he promises he didn't mean to. But it got me thinking that maybe I shouldn't do our own events. Is it weird? You can be honest. Junior Awesome had fun with Rita during this, and then later we went into downtown Raleigh for 4th of July festivities. 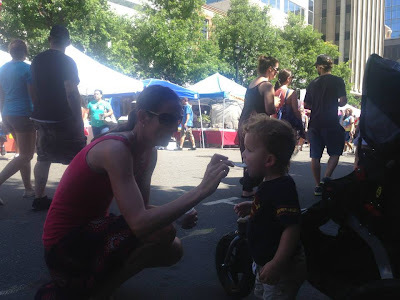 It was full of vendors and fair food and performers and kids stuff (but big kid stuff, not Logan-age stuff, unfortunately), but it was still fun to be in the scene. 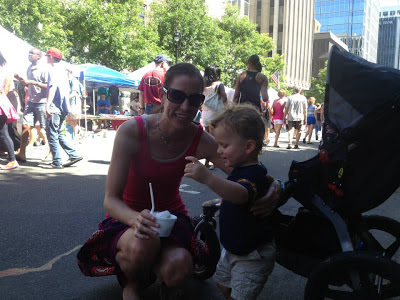 Trying out some ice cream. Quit smiling at the camera, lady, and gimme more! After downtown we stopped at Pullen Park on our way home. Logan loves trains and he wouldn't even play on the playground because he wouldn't stop pointing and saying 'choo choo! choo choo!' at the little train you can ride that goes around the park. But once on, he was totally stoic. I could not get him to crack a smile. I love trains. Really, I do. 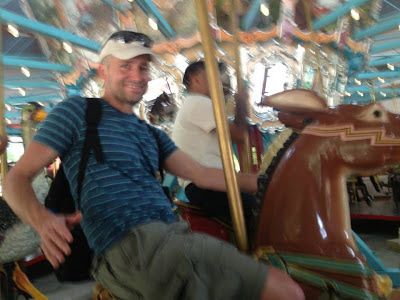 Then we hit the old fashioned carousel which goes really freaking fast!! Logan was not going to let us put him on one of the horses, but he was content to sit with me on the benches that don't move. Marty on a horse next to us. Actually, he was on a donkey. haha. All in all, it was a great 4th of July!! I've never done an aquathon - methinks I don't ever want to now! HAHA!! And I totally don't think it's weird that you do your own events. It's not like you know a super secret shortcut or anything - you race just like everyone else on the same course! Congrats on the win! We would have been out, but I had a sprint on the 7th and Paul has done something to his knee. I don't think there is anything wrong with you participating. Clearly you had competition and you kept them motivated. If you create a beginner event and make everyone look bad that would be different. That carousel is crazy fast, I get a little sick every time I ride it. I will NEVER do an aquathon. That sounds miserable. I think you should do your own events. I typically have no idea who is involved in putting on an event anyway so I wouldn't even know if the organizer was or wasn't the winner. Plus, it's not like it's a quiz show and you get the answers. You race the distance like everyone else. Maybe you take yourself out of the awards for your own races?